Change the look of how currency is shown in your WooCommerce store. To change your shop currency settings go to: WooCommerce > Settings > General > Currency Options and select your desired currency from the Currency drop down. Currency – Choose the currency the store will be priced in. Currency Position – Choose whether the currency symbol is placed to the left or right of the price. Thousand Separator – Choose the character to use for the thousand separator. Decimal Separator – Choose the character to use for the decimal separator. Number of Decimals – Choose the number of digits to appear after the decimal separator. This is considered a customization, which is not covered under our Support Policy. Be sure you feel comfortable with code or troubleshooting your site. WooCommerce only allows for one base currency at a time. Currency Converter Widget: change the display of prices only. This will not actually change the currency you charge your customers, as this will still use the base currency. Using the Currency Converter Widget enables your store to run on a single currency, which simplifies your store administration, accounting, and general maintenance. The Currency Converter Widget helps your customers to view your product catalog in their native currency, despite checking out in your set base currency. WooCommerce Multi-currency: allow customers to pay in the currency of their choice. MultilingualPress: Display your content, products, and prices in multiple languages and currencies. When desiring a multi-currency store, we urge you to consider the reasons you would like multiple currencies. If you are looking to offer multiple currencies as a way to entice purchasers from specific regions, and to offer a comparitive price between your currency and another, the Currency Converter Widget will aid in achieving this. 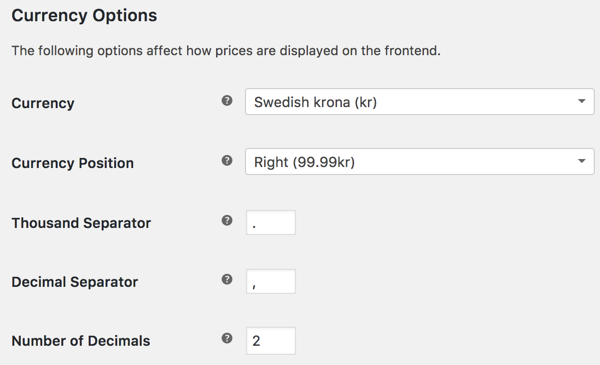 If you are looking to customise the content of your products entirely, and to adjust the price of your products manually for each specific product (ie: not a direct conversion, based on the exchange rate), one of the multilingual plugins above would aid with this. Note: We are unable to help provide support for third-party (non-Woo) plugins, so it is best if you contact the plugin developer with questions/concerns. Without the Currency Converter Widget, the customer needs to do their own research on the exchange rate and how much their bank charges to exchange currencies to pay for the order. For example, if you were to travel to Europe with your US-based credit card, you would purchase something in Euros (the shop base currency) and your bank would charge you the conversion and any international fees they apply. The same process applies to WooCommerce: The exchange rate and fees are not charged by WooCommerce; they’re charged by the customer’s bank that sets the exchange rate and associated fees.